Any squeak in your vehicle can be annoying, especially if it continues to get worse and you do nothing about it. Here are four common types of squeaks that come from the brakes—common problems that come through the shop everyday—plus a fifth (bonus) brake noise, a scraping noise. I hope I can help you understand what's causing your brakes to squeak. To make this discussion clearer I'll tell you that there are two types of brakes. 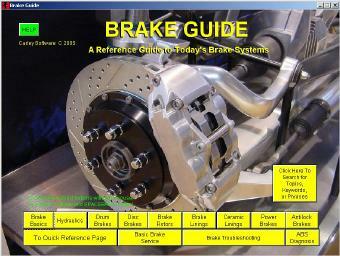 Most brakes today are disc brakes, where a pad presses against a disc or rotor to stop the car. The first three squeaks described here come from disc brakes. Many cars have drum brakes on the back wheels, where a curved “shoe” presses against a hollow drum to stop the car. The last squeak here is made by drum brakes. Getting rid of an annoying brake squeal and other disc brake noise is like trying to cure a bad case of herpes. You can treat the symptoms and improve the patient's condition. But it is virtually impossible to eliminate the underlying cause. Fortunately, brake noise is not caused by a virus. It is caused by a combination of factors that sometimes add up to create noise. Brake squeal is really a high frequency vibration. In disc brakes, it can be caused by vibrations between the pads and rotors, the pads and calipers, or the calipers and their mounts. In the photo above, the noise produced by a brake rotor in a test lab has been captured electronically and converted into a color graphic. The red areas are producing the loudest noise while the green areas are producing the least noise. In drum brakes, the vibrations can originate between the shoes and drums, or between the shoes and backing plates. We can't say why brake noise is so annoying. It just is. To some people, it has the same effect as scraping your fingernails across a blackboard. They can't stand it, even if it is "normal" for many vehicles today. Most people want nice, quiet brakes that stop smoothly with a reassuring "shhhhh" sound. No scraping noises. No high pitched squeals that would make a dog howl. No concerned looks or stares from passengers, other motorists or nearby pedestrians who wonder if the vehicle is going to stop or not. One way to quiet noisy pads is to make sure the pads fit tightly in the calipers. If the pads on a single piston caliper have mounting ears or tabs that need to be bent or hammered to hold the pad in position, make sure the pad can't be wiggled by hand. If the pads have clips, shims or antirattle springs, make sure the necessary hardware is in place and properly installed. If you see no such items when you inspect the brakes, do not assume that none are needed. The last guy who worked on the brakes may have left them off. It is always a good idea to look up an illustration or parts list for the brake system to make sure all the required parts are there. If the pads are installed correctly but are still noisy, one of the least expensive and most effective ways to quiet them is to remove the pads and install insulator shims on the backs of the pads. The shims, which are usually self-adhesive, act like little seat cushions to dampen vibrations between the pad and caliper. Another option is to apply a noise suppressing compound to the backs of the pads. Some compounds harden to a rubber-like consistency to cushion the pads. Another good choice is to apply a moly-based brake lubricant to the backs of the pads. Brake lubricant is long lasting and won't burn or wash off like brake grease can. If applying a lubricant to the backs of the pads, be careful not to get any on the front side of the pads or rotor! The same approach can be used on the calipers. Cleaning and lubricating the caliper mounts can also help dampen vibrations to quiet the brakes. Vibrations here can be caused by worn or loose mounts or mounting hardware. If the calipers are badly rusted or worn, they may have to be replaced. But in most instances, you can probably clean them up, lubricate the mounting points and return them to service. You may have to replace the caliper slides, pins, clips and/or bushings, though, if there is too much play or looseness between the caliper and knuckle. Be sure to use a high temperature brake grease so the grease stays where it belongs. Some disc brake pads are noisy than others. Semimetallic pads are typically the ones that cause the most noise problems because they are harder than nonasbestos organic (NAO) pads. Their high metallic content often makes them squeal when metal rubs against metal. The amount and type of fillers and binders in a friction material can make a big difference in the amount of noise a given set of pads or shoes produce. Ingredients such as graphite, carbon and "rubber modifieds" may be added to reduce noise. Brass is another ingredient that helps dampen noise (it also has a cleaning effect on drums and rotors). Many of the newest pads designed for quiet operation use a nonmetallic "ceramic-enhanced" formula to eliminate noise. The design of the pads themselves can also affect the amount of noise produced. A chamfered leading edge on the pads eliminates the sharp edge so the pads will slide across the rotor without grabbing and vibrating. Slotting the pads changes the frequency at which the pads oscillate so noise can be tuned out of the brake system. Some pads also have a special coating that transfers to the rotor surface when the pads are first used. The coating material leaves a film on the rotor that reduces noise, vibration and also rotor wear. The transfer film also makes the pads less sensitive to variations in the surface finish on the rotors. If the original pads are too noisy and can't be quieted by insulator shims, noise compound or grease, therefore, replacing them may be the only way to get rid of the noise. These brake pads are completely worn out. Brake pads should never be allowed to wear down to bare metal as this will also ruin your rotors. Some brands and grades of aftermarket brake linings are quieter than others. So you may have to experiment with several different ones to find the quietest set for a given application. But whatever you do, do not substitute asbestos or nonasbestos organic (NAO) pads for semimetallic pads unless the friction material supplier says it is okay to do so. Asbestos and NAO do tend to be quieter than semimetallics but can't withstand the heat that semimetallics can. Consequently, if you swap asbestos or NAO for semimetallics in a front-wheel drive car or minivan where the brakes run hot, it can reduce the life of the linings significantly (up to half or more!) and increase the risk of overheating and brake fade. After you have installed the new pads, it is a good idea to break them in (unless the pads are the "fully cured" type that do not require an initial break-in period). Not breaking in a new set of pads increases your risk of pad glazing and brake noise. 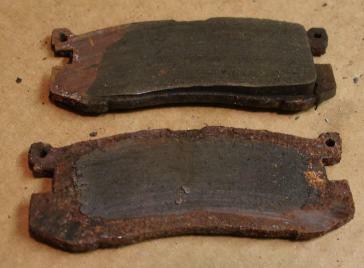 A driver can glaze and ruin a new set of pads if he fails to go easy on the brakes for the first 200 miles. If he overheats the brakes by mashing down on the brake pedal at every stop light, he can cook the resin in the pads before it can cure and glaze the pads. Pads that require an initial break-in can usually be seated by making 20 to 30 easy stops from about 30 mph with at least 30 seconds between brake applications so the brake pads have enough time to cool. Whether a new set of brake pads need to be broken-in or not, you should still test drive the vehicle to make sure the brakes are operating properly and that your efforts to eliminate the noise problem have been successful. In addition to replacing the brake pads, it may be necessary to resurface the rotors to cure a noise problem. To brake quietly, the rotors have to be in good condition, relatively smooth and flat. So if the rotors are rough, glazed or have not been finished properly, they'll have to be resurfaced. How smooth do the rotors have to be? OEM requirements vary, but generally speaking a surface finish that ranges anywhere from 15 to 80 microinches should be acceptable, though GM recommends a surface finish of 60 microinches or less. A smooth finish will reduce the risk of brake noise and brake squeal. Unfortunately, there is no easy way to measure surface finish short of buying an electronic "surface profilometer," a device which drags a calibrated stylus across the surface to measure roughness. Profilometers are expensive and nobody except brake part and equipment suppliers can afford to buy them. So the next best way to check your work is with a "surface comparator gauge." This type of gauge, which is available from machine shop suppliers as well as some gasket manufacturers, generally costs less than $50 and has sample patches on a metal plate that you feel or scratch with your fingernail to compare finishes. Another way to check the surface finish on a rotor is the ball point pen test. Write you name on the rotor. If the ink leaves a continuous line, the surface is smooth enough. But if the ink line is broken up into dots, the surface is too rough (or coated with grease!). How the brake rotors are resurfaced does not matter as long as they end up with a high quality smooth finish. Bench lathes and on-car lathes are both capable of high quality finishes when used properly. But both require sharp tooling and the right feed rate and spindle speed or drive speed to produce a good finish that resists brake noise. For best results, many experts recommend using round lathe bits. These will produce a smoother finish (up to twice as smooth as a new rotor!). If the crossfeed rate is too high, the lathe bit can groove the rotor like a phonograph record. There will be too much space between the peaks and valleys on the surface of the rotor making it unacceptably rough and noisy. What you want are narrow peaks and valleys. This may require you to slow down the crossfeed rate or adjust the spindle or drive speed (if possible). Specific operating recommendations will vary with the type of equipment you are using, but if you are turning rotors on a lathe with a fixed spindle speed (100 rpm) and a fixed crossfeed rate of .003 in. per revolution, you should get a suitable finish. On lathes with adjustable spindle speed and crossfeed, a speed of 100 rpm with a crossfeed of .002 to .008 in. should give satisfactory results. A silencer band or vibration dampening attachment should be used while turning the rotor to eliminate tool chatter. After the rotors have been turned, you can sand them with #150 grit sandpaper to smooth the surface finish. Press two sanding blocks against both sides of the rotor while it is turning slowly on a bench lathe for about 60 seconds. Or, you can do the same thing with a "Flex-Hone" tool for rotors made by Brush Research Manufacturing. The flexible beaded abrasive on the Flex-Hone tool works better than an abrasive pad in a drill. The key point here is to achieve an EVEN surface finish with no high spots or low spots on the rotor. A final step that is often overlooked but is just as important as any of the others just mentioned is to clean the rotors after they have been turned. Use warm soapy water and a stiff brush. Aerosol brake cleaner is NOT as effective and won't remove metallic debris that can become embedded in the new pads you have just installed. To check cleanliness, wipe a clean white raga across the surface of the rotor. If you see any gray streaks on the rag, the rotors are NOT clean. To reduce the risk of brake noise during pad break-in, there are aerosol "brake silencing treatments" that can be applied to rotors to help suppress noise. These are spray-on coatings that are applied to the rotors after they have been resurfaced. Some contain microfine aluminum particles, graphite and moly that fill in the valleys on the surface of the rotors and act as a temporary lubricant to help the new pads burnish in more gradually. This not only reduces brake noise but also helps the pads develop a better cure which actually increases the coefficient of friction slightly, according to one supplier of this type of product. One of the leading causes of brake squeal in drum brakes is brake dust inside the drum. Removing the drum and cleaning the brakes, therefore, may be necessary to eliminate this kind of noise. Use an aerosol brake cleaner or brake washer to clean the brakes. Never, ever blow out the drums with compressed air because doing so blows zillions of microscopic fibers into the air, which you certainly want to avoid if the vehicle has asbestos linings. Another cause of brake noise in drums is poor contact between the shoes and drum. Heel and toe contact between the shoe and drum is often the culprit, and the cure is to either replace the shoes with new ones or to resurface the drum slightly to increase its inside diameter. New shoes are ground with a slight eccentric to compensate for drum wear. This moves the point of contact away from the ends of the shoes toward the middle. In the old says, mechanics used to arc shoes to match their shape to the drum. But with the concerns about asbestos, shoe grinding is pretty much a thing of the past (though it might make a comeback if and when asbestos is totally out of the picture). Other causes of drum noise can include weak or loose hardware (replace it), and vibrations between the shoes and the raised pads on the backing plates (apply brake grease).